Our accommodation is located near the centre of Conil and a few minutes walk from the beach. Rooms in the Plus apartments have a private bathroom, a balcony and free Wi-Fi access. We have found and selected Spanish families who are open and friendly hosts, they embrace and help our students to quickly integrate into family life. If you want more independence and seeking more comfort, we are happy to book a private apartment. You can choose from a one bedroom apartment to a house or cottage. 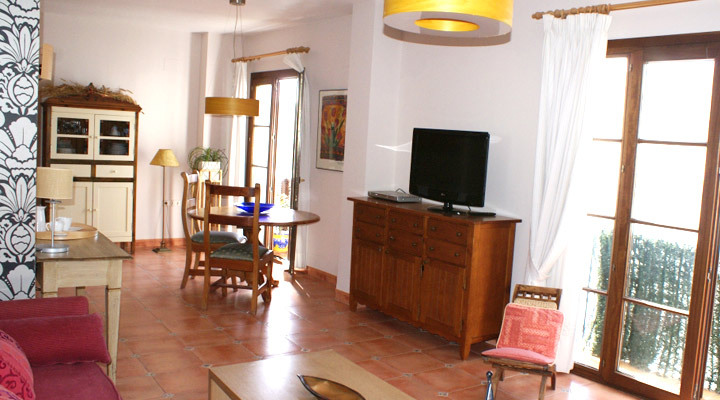 These apartments are located in the center of town, about a 5-10 minute walk from the beach and from Academy Atlantika. They feature 2-3 bedrooms, kitchen, living room, 1-2 bathrooms and roof terrace. There are single and double rooms available. The kitchen is fully equipped and has a washing machine. Linen is provided, but not towels. All apartments have a roof terrace. The cleaning of the apartments should be performed by students prior to departure. Academy Atlantika and the beach are a few minutes walk. The central location of these apartments offer quick access to shops and supermarkets. Partners who are not attending one of our courses, can also book accommodation through the school. These are shared Apartments with 2 rooms (each room can be booked as a single or double room). People travelling alone up to 30 years of age can book a single or double room (shared with another student). Your accommodation will be available from 14 p.m. the Sunday prior to the start of your Spanish course and must be vacated by 11 a.m. on the Saturday following the end of your course. These apartments are located in the school building in the village center, just minutes from the beach. They have two bedrooms, each with their own bathroom, fully equipped kitchen and living room. They are also equipped with radio, television, Wi-Fi and a washing machine. We provide linen and towels. Many of the apartments have a balcony and access to a furnished rooftop terrace overlooking the Atlantic Ocean. The central location ensures quick access to the market, small shops and supermarkets. The center is a two-minute walk and you can reach the beach in less than five minutes. Prices include a maid service twice a week. People traveling alone and want to stay in our plus apartment, must book a single room. Your accommodation will be available from 14 p.m. the Sunday prior to the start of your Spanish course and must be vacated by 11 a.m. on the Saturday following the end of your course. Additional nights are only accepted after written confirmation. 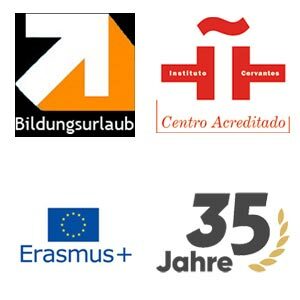 We have found and selected Spanish families who are open and friendly hosts, they embrace and help our students to quickly integrate into family life. The high quality of accommodation and meals are key criteria in our decision to work with our host families. 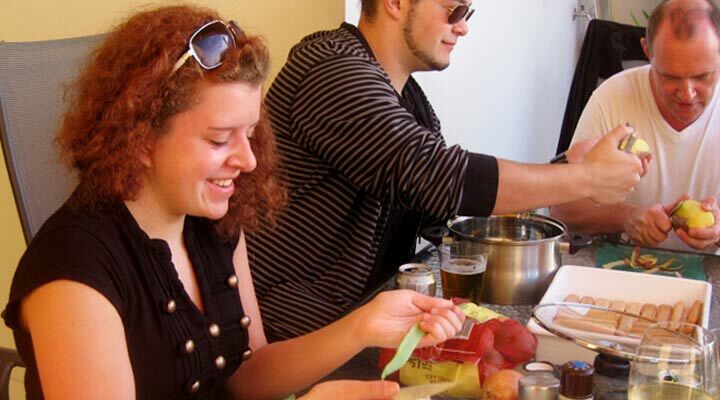 We have a variety of hosts ranging from families with children, couples or single people who like to spend their time with foreign students. Living with a family is the ideal way to learn to communicate in daily life and gain a deeper insight into Spanish culture and traditions. This offer is especially popular among young people and groups travelling together. There are single and double rooms available (double room for single travelers only until the age of 30 years). Half board and laundry service are included in the price. *A separate bathroom can be booked for an additional charge. Your accommodation will be available from 14:00pm the Sunday prior to the start of your Spanish course and must be vacated by 11:00am on the Saturday following the end of your course. If you want more independence and seeking more comfort, we are happy to book a private apartment. You can choose from a one bedroom apartment to a house or cottage. Let us know if you would prefer to stay downtown, next to the school or even outside of town, such as the Atalaya area. If you are interested please send us information about the type of accommodation you would like and the dates you’d like to reserve, and we will give you a range of available options and prices. Prices vary from approx. 35 Euros – 120 Euros per day, depending on season, facilities, size and location.